It's a very Octoberish weekend, as we have a trio of films that have elements of what makes for an interesting movie, that could in theory appeal to mass audiences – and none look particularly bad – but neither do any of them have a real breakout possibility. It's a weekend for people who just have to see something new. Leading the way in prestige, if not necessarily quality, is The Judge. 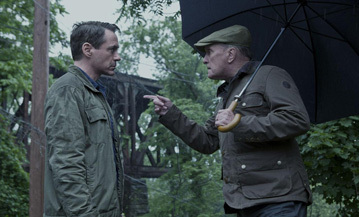 Starring Robert Downey Jr. and Robert Duvall, it is surprisingly not a John Grisham adaptation, although it probably wouldn't disabuse you of that notion if you asked it. Downey plays an attorney who has an unusual client in a murder trial – his father, still a judge in his hometown. While the saying goes that a man who is his own lawyer has a fool for a client, a man representing his father is probably just going to be aggravated beyond belief. In returning to his home to help keep his aging father out of prison, Downey also has to confront old grudges and demons (not of the literal kind – this isn't another Conjuring spinoff, although that gives me an idea) of a town he thought he'd left behind. The lovable scoundrel lawyer is a fairly standard stock character in cinema, and Downey is among the best casting choices to play one. Duvall is also your go-to guy for cantankerous old coots, which he's asked to play here and does so to a T. In fact, the whole film seems constructed entirely out of small town legal film cliches, crossbred with a daddy issues film. With this cast, which also includes Billy Bob Thornton, Vincent D'Onofrio, Dax Shepard and Vera Farmiga, that may just be enough to have it masquerade as a quality film for audiences despite the mediocre reviews.